Step Eight: Paint. Yesterday I was able to work on the painting a little more. Continuing with the petals and trying to make the oranges work together. Slowly working my way around the painting I added more definition to the light and dark areas. I completed the background. The shades of green used are more on the cool side as I have been keeping in the mind the Complimentary Colour Scheme for this painting. Red Orange vs. Blue Green. I want to keep the background looking more abstract than literal by vaguely suggesting leafy shapes. The shapes used are not precious and only contain enough information to make their subject matter known. I may go back in at the end if dark areas need to be darkened even more. I won’t know this until the flowers are complete. Over all there are several Colour Harmonies happening in this painting. Such as, Analogous Harmonies of Green, Blue and Blue Violet, Split Complimentary Harmonies of Orange, Red-Orange and Red and Triadic. I feel using these colour tools will help make this a compelling painting. Very excited to see it completed! It’s very colour oriented and this is something I want to keep exploring in my work. Future Blog Entry: Colour Theory! 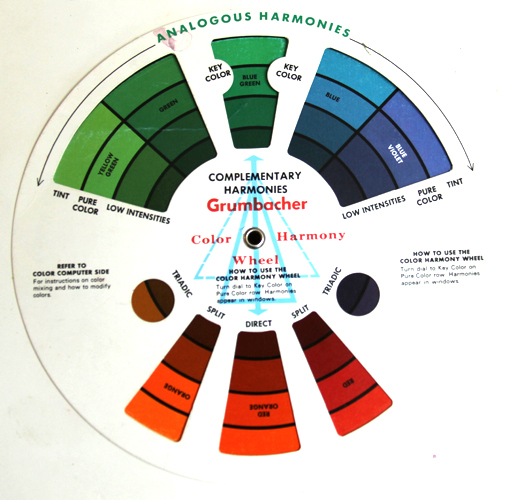 Below I have included a photo of my indispensable Grumbacher Colour Wheel which I have had this since College! Definitely something every artist should invest in! After all that here is the painting! 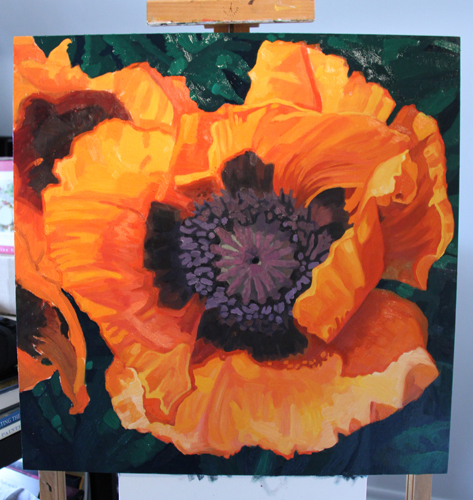 I will be continuing with petals and then moving on to the other two poppies. After that I should be onto Step Nine. Tweak. Then Step Ten. Final Prep.